Cadmium pigments are a class of pigments that have cadmium as one of the chemical components. Most of the cadmium produced worldwide has been used in the production of rechargeable nickel-cadmium batteries — themselves being replaced by other rechargeable nickel-chemistry cell varieties like NiMH cells — but about half the remaining consumption of cadmium, which is about 2,000 tonnes (2,200 short tons) annually, is used to produce colored cadmium pigments. The principal pigments are a family of yellow, orange and red cadmium sulfides and sulfoselenides as well as compounds with metals other than cadmium. Brilliantly colored, with good permanence and tinting power, cadmium yellow, cadmium orange and cadmium red are familiar artists’ colors, as well as being frequently employed as architectural paints, since they can add life and vibrancy to renderings. Their greatest use is in the coloring of plastics and specialty paints which must resist processing or service temperatures up to 3,000 °C (5,430 °F). The color-fastness or permanence of cadmium requires protection from a tendency to slowly form carbonate salts with exposure to air. Most paint vehicles accomplish this, but cadmium colors will fade in fresco or mural painting. Cadmium yellow is cadmium sulfide (CdS): C.I. Pigment Yellow 37. Cadmium sulfoselenide is a solid solution of CdS and cadmium selenide: depending on the sulfur to selenium ratio, C.I. Pigment Orange 20 or C.I. Pigment Red 108 is obtained. 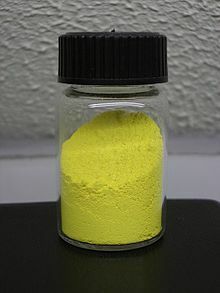 Zinc cadmium sulfide is a greenish, solid solution of CdS and zinc sulfide: C.I. Pigment Yellow 35. Cadmium yellow is sometimes mixed with viridian to give a bright, pale green mixture called cadmium green. When first introduced, there were hardly any stable pigments in the yellow to red range, with orange and bright red being very troublesome. The cadmium pigments eventually replaced compounds such as mercury(II) sulfide (the original vermilion) with greatly improved light-fastness. Cadmium pigments are known for excellent light-fastness, although the lighter shades can fade in sunlight. A cadmium yellow paint was frequently used on Bob Ross' TV show, The Joy of Painting. Borosilicate glass colored with cadmium compounds. Cadmium compounds are utilized in coloring borosilicate glass used by artists in lampworking. The palette is often referred to as 'cadmium colors' or 'cadmium-based colors' and is marked by uniquely bright and saturated tones not found in other colored glass. Cadmium pigments used in borosilicate have a relatively short history, with the first commercial formulations hitting the market in 2000 under the name 'Crayon Colors' by Henry Grimmett of Glass Alchemy. Cadmium-compound-containing glass exhibits a characteristically low heat tolerance when melted and therefore must be treated with caution when lampworking to avoid boiling off of the cadmium sulfide. CdS has a boiling point of 980 °C (1,800 °F), putting its maximum temperature tolerance as a pigment not far above the working temperature range for borosilicate, which has a softening point of approximately 850 °C (1,560 °F). Cadmium sulfide is not very toxic (LD50 above 5,000 mg/kg) when used as a pigment, although acute exposure to cadmium vapors from welding is harmful. The cadmium pigments have been partially replaced by azo pigments. These have significantly inferior lightfastness, but still good, and they have the advantage of both being cheaper and non-toxic. In some countries, consumer activists such as Michael Vernon in Australia were successful in banning the use of cadmium pigments in plastics that could be used for toy manufacture, owing to the toxicity of cadmium. In December 2013, the Swedish Chemicals Agency (KEMI) proposed a case to the European Chemicals Agency (ECHA) in favor of restricting or banning cadmium use in pigments used in artists’ paints, as cadmium in pigments used in other types of paints was already restricted and regulated via TARIC codes and REACH Annex XVII. This proposal stated that cadmium in the body leads to increased risk of bone fractures and breast cancer and an array of environmental impacts. Ultimately, this proposal was declined. Inhalation is the biggest risk of these pigments, though cadmium is very low-risk sealed within a pigment particle due to insolubility. The use of chalk pastels containing cadmium colors is of the highest risks when it comes to relevant artist media, since as the pastel is used it is creates a dust which can be inhaled, unlike when using paints. KEMI's proposal stated that paint washed down the drain is absorbed by crops, which in turn are consumed and increase the average dietary cadmium intake. This can cause an array of health effects, including kidney and liver damage, skeletal damage, several types of cancers, and death. Cadmium is introduced into the body most commonly through smoking, and in individuals who do not smoke, the next most common instance is through dietary consumption. ^ "MEPs Ban Cadmium from Power Tool Batteries and Mercury from Button Cells". European Parliament. ^ "Cadmium Pigments". Retrieved 30 November 2010. ^ "Borosilicate glass material properties". Adams & Chittenden Scientific Glass. Retrieved 12 April 2019. ^ "About Us". Glass Alchemy. Retrieved 2018-11-05. ^ Weissler, G. L.; Carlson, R. W., eds. (1980). Vacuum Physics and Technology (1st ed.). New York: Academic Press. ISBN 9780124759145. OCLC 5170642. ^ "Cadmium sulfide". PubChem. NCBI. Retrieved 2018-11-05. ^ Johansen, Tony (2006-05-06). "Yellow". Making Artist's Paint. Retrieved 2013-07-31. ^ Jill (2010-01-06). "Yellow". Art School at Home. Retrieved 2013-07-31. ^ Gavett, Ben. "Will Cadmium Colors Always be on the Palette? (Part 2)". Just Paint. Golden Artist Colors, Inc. Retrieved 5 December 2018. ^ "Annex XV restriction: Report proposal for a restriction" (PDF). ECHA. Retrieved 5 December 2018. ^ Hoakley (15 June 2018). "Pigment: Controversial Cadmiums, yellow to red". The Eclectic Light Company. Retrieved 5 December 2018. ^ Kawasaki, Takashi; Kono, Koichi; Dote, Tomotaro; Usuda, Kan; Shimizu, Hiroyasu; Dote, Emi (2004). "Markers of cadmium exposure in workers in a cadmium pigment factory after changes in the exposure conditions". Toxicology and Industrial Health. 20 (1–5): 51–56. doi:10.1191/0748233704th189oa. PMID 15807408. ^ Kim, Hyun-Soo; Kim, Yeo-Jin; Seo, Young-Rok (December 2015). "An Overview of Carcinogenic Heavy Metal: Molecular Toxicity Mechanism and Prevention". Journal of Cancer Prevention. 20 (4): 232–240. doi:10.15430/JCP.2015.20.4.232. ISSN 2288-3649. PMC 4699750. PMID 26734585. ^ Järup, Lars (1 December 2003). "Hazards of heavy metal contamination". British Medical Bulletin. 68 (1): 167–182. doi:10.1093/bmb/ldg032. ISSN 0007-1420. Retrieved 5 December 2018. ^ "Cadmium (EHC 134, 1992)". InChem. IPCS. Retrieved 5 December 2018. Fiedler, I.; Bayard, M. A. (1986). "Cadmium Yellows, Oranges and Reds". In Feller, R. L. Artists' Pigments: A handbook of their history and characteristics. 1. Oxford University Press. p. 65–108. ISBN 9780894680861. "Cadmium and compounds". National Pollutant Inventory. Archived from the original on 2006-12-10. "Cadmium yellow". Pigments through the Ages. WebExhibits. "Cadmium orange". Pigments through the Ages. WebExhibits. "Why are cinnabar, vermilion, and cadmium orange colored?". Causes of Color. WebExhibits.